Our 7 ‘Casa Spa’ guest rooms are meeting the need of a lesser, entry priced accommodation which will permit more families to enjoy the Hacienda de los Santos experience. The rooms feature either one King or two plus Queen beds and all face a small courtyard and plunge pool. Some of the rooms have wood burning fireplaces and all have showers with one ‘Spa Room’ having both a bathtub and separate shower. The rooms are adjacent to the Spa facility which was built in 2015, thus in keeping with a tranquil Spa atmosphere of Casa Spa, there are no television sets or telephones in the rooms. There is however one telephone in the portal which may be used for room service or special requests. Each room has a safe and unlimited bottled water is provided. The floors are beautiful handmade clay tile in the portal and all rooms have sound proof double glazed windows due to the proximity to the street. During festivals there still may be some sound carried into the rooms facing the street side. Complimentary Wi-Fi is provided in the ‘Casa Spa’ as well as off-street parking nearby. 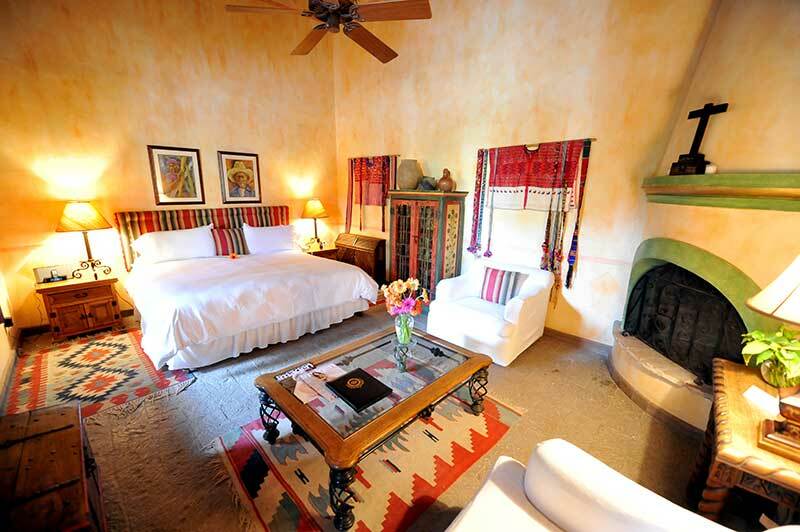 In general, the ‘Spa Rooms’ are similar to ‘Hacienda Guest Rooms’, however less ‘Colonial’ in design and more rustic, yet with a great deal of charm as well as the colorful and comfortable shared portal areas outside of each room. Casa Spa guests are entitled to use all of the facilities of Hacienda de los Santos, including the other three pools, gym and theater at no additional cost. We encourage guests who require the use of a telephone in their room, or possibly a larger guest room, to consider a Hacienda Guest Room.